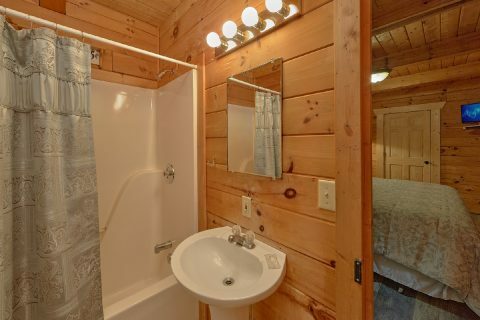 Ready for a cabin vacation near Dollywood you won't forget? 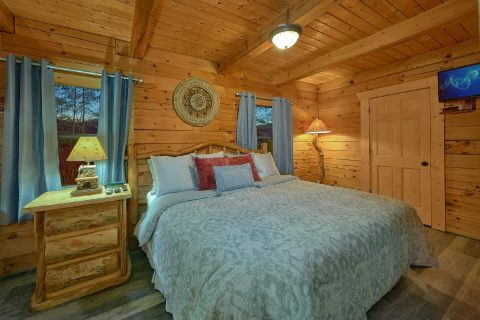 Simply book "The Waterlog" cabin that's located only 8 minutes away from Dollywood and Downtown Pigeon Forge! 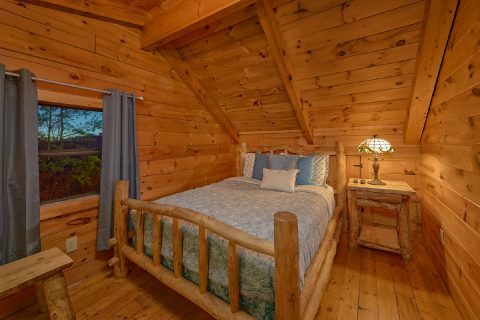 This two bedroom cabin sleeps up to 6 guests in Smoky Mountain luxury. From this rental's beautiful location in the Upper Middle Creek Rd. 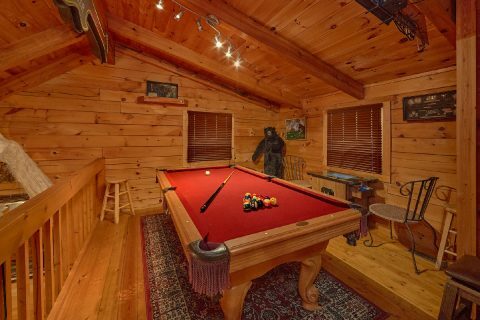 area, guests of this rental can expect lovely mountain views and convenient access to the region's top activities. 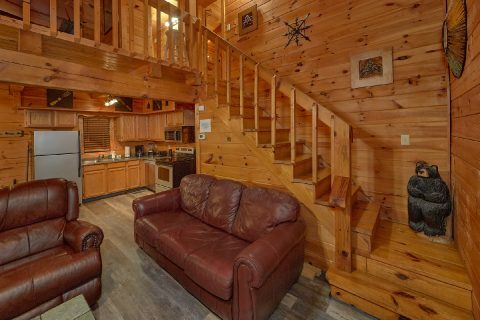 Step inside your luxury cabin rental, and you'll be struck by the cozy log interior complete with all the bells and whistles needed for a comfortable cabin vacation. 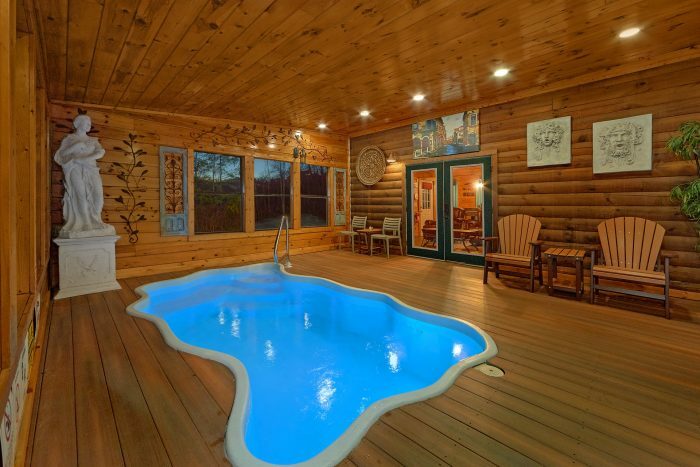 The premier amenity in this cabin close to Dollywood is no doubt the heated, private, in-cabin pool that offers guests year-round swimming. Splash and play in the water whenever you like and enjoy a dip in privacy and seclusion. 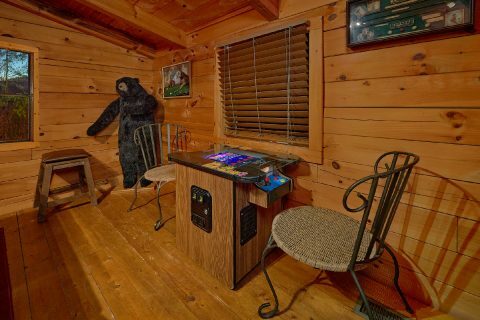 Another excellent feature included in your cabin is the lofted game room with a pool table for enjoying hours of competitive fun with friends and family. 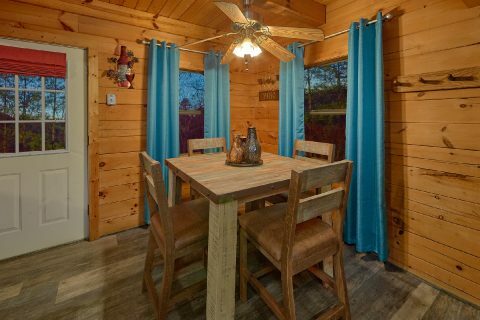 Outside on your cabin's deck, you can enjoy the fresh air and a beautiful mountain view while you soak in the hot tub or sit on patio furniture. 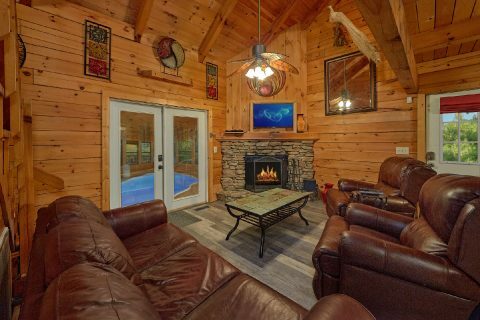 The living room area with a wood burning fireplace and leather furniture is ideal for watching a movie in your cabin. 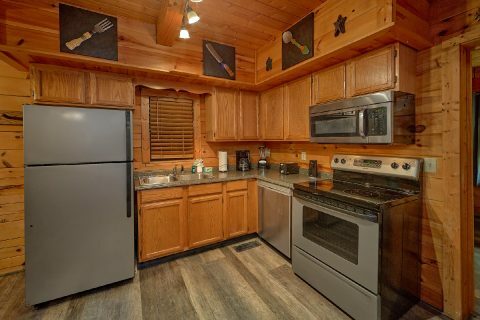 Some features you'll appreciate in your Pigeon Forge rental are WiFi Internet access and a full in-cabin kitchen that offer you convenience and all the comforts of home. A nearby dining table or the outdoor patio furniture make great places for enjoying meals with your family. For great adventures at local attractions, the possibilities are nearly endless. You can explore Pigeon Forge's history at the Old Mill, see panoramic views from the Smoky Mountain Wheel, ride 40 mph go karts, see a funny dinner show, or enjoy an interactive exhibit at the Titanic museum. 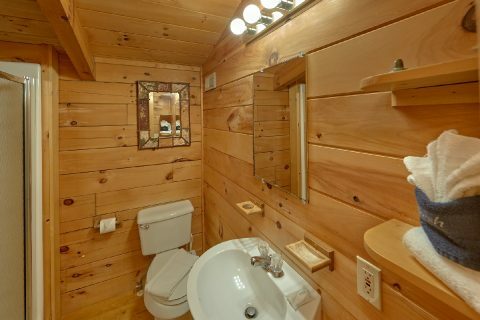 Planning a cabin vacation that requires more room that "The Waterlog" provides? 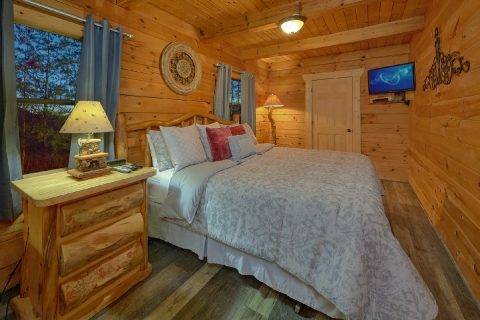 Consider booking several of our other cabin rentals near Dollywood. 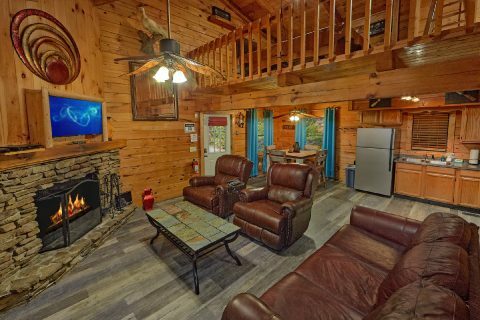 Not only are these cabins convenient to one another, but booking multiple cabins is a great way to comfortably accommodate big groups! Don't hesitate to call our office if you're interested in booking several cabins for your Pigeon Forge vacation. 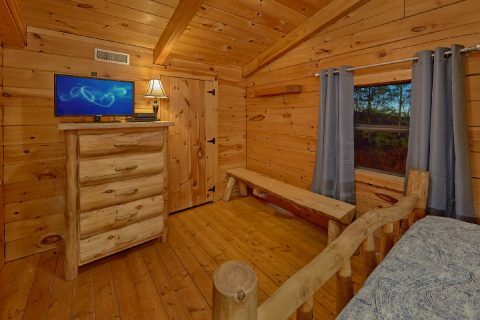 Don't forget to book "The Waterlog" with Cabins USA to earn a terrific 15% discount! Just check this cabin's availability and see how much you can save on a fun-filled Pigeon Forge vacation complete with the luxury of an in-cabin swimming pool.